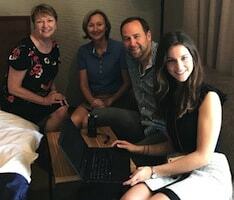 Dr. Marie-Christine Franken and Dr. Janet Beilby join Kerianne Druker and Dr. Tom Weidig at the One World, Many Voices: Science and Community World Congress in Hiroshima, Japan to discuss stuttering treatment, early intervention, research, and much more. They have a spirited discussion about the future possibility of turning on and off gene mutations related to stuttering. One interesting point made was that the field knows how to make people “fluent” and the goal now is figure out the underlying mechanisms. Dr. Marie-Christine Franken is a Specialist Fluency Therapist and the Speech-Language Research Lead at the Speech & Hearing Department of Erasmus University MC in Rotterdam, the Netherlands. Dr. Franken and her team of researchers published a seminal scientific study Direct versus Indirect Treatment for Preschool Children who Stutter: The RESTART Randomized Trial. Dr. Janet Beilby, Ph.D., is Senior Lecturer and Clinical Educator at Curtin University in Western Australia and has been a lecturer, researcher and clinician in the field of stuttering for over 30 years. Dr. Beilby has treated thousands of clients, trained hundreds of students and been awarded over half a million dollars in research funds investigating varying aspects of stuttering disorders.